A week after a flooded Cochin International Airport Limited (CIAL) shut down flight operations, it announced on Wednesday that the operations will resume on August 29, three days later than the scheduled opening on August 26. CIAL issued a statement saying the opening of the Kochi airport had to be postponed after a review of the situation. “A meeting was held at CIAL today to review the damage control activities at Kochi airport, wherein most of the stake-holders including airlines and ground handling agencies expressed their concerns over mobilising manpower,” said the CIAL statement, adding 90 per cent of their staffers got affected with the flood and were out of station. “Nearby hotels, restaurants and eateries still remain close. As central Kerala is yet to recover from post flood trauma, it is a daunting task to arrange local commutation, logistics of catering items, which will cause a cascading effect on the passengers,” said the statement. In view of these apprehensions, CIAL said, it decided to postpone the date of resuming operations by three more days. “We will be starting all operations at 1400 hours in 29/08/2018,” reads the statement. The airport is located close to the Periyar river, and flood waters from the swelling river had inundated the airport premises forcing it to shut all operations on August 15. 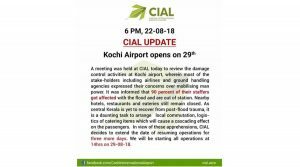 CIAL had first announced that the Kochi airport would remain shut till August 18 but had to defer the date to August 26 due to severe waterlogging. 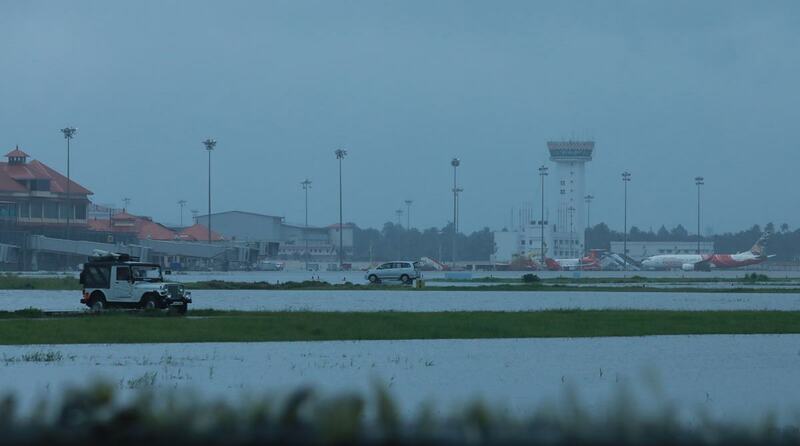 On Tuesday, CIAL had said the airport lost almost 2,600 metres of the perimeter wall due to the flooding. While the water had receded from the runway, taxiway and parking bays, the runway needed two days to complete the milling work it required. Kochi international airport is the seventh-largest in the country in terms of passenger traffic, with international passengers comprising almost 55 per cent of the traffic. According to a CARE Ratings report, a passenger traffic of around 3.5-4.5 lakh is expected to be affected over the next fortnight or so, causing a revenue loss of Rs 22-27 crore. “An additional loss of business and revenue for other operations and services at the airport is expected to the extent of Rs 8-12 crore,” said the report. According to latest official figures, the death toll stands at nearly 370 while over 1 million people have taken shelter in more than 3,000 relief camps.